In a way, Nielsen’s numbers were exactly what you’d figure they’d be. 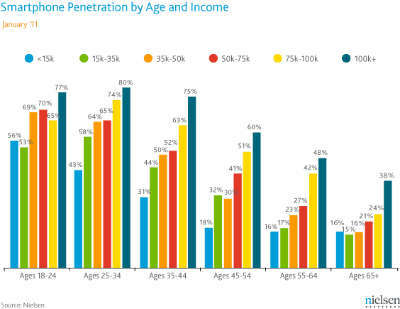 The younger the respondents, the more likely they are to own a smartphone. And oddly enough, the wealthier the respondents are, the more likely they are to own a smartphone. So yes, as it turns out, the folks most likely to own smartphones are 25-34 year olds making 100 thousand dollars a year. Interestingly enough, nearly half of respondents aged 55-64 that make 100 thousand dollars a year (48 percent) said they owned a smartphone. 60 percent of the same income level at 45-54 year olds owned one. By now, you’re probably looking at all these facts and figures and wondering, what does this mean for my small business? The question now becomes one of knowing your customer base. 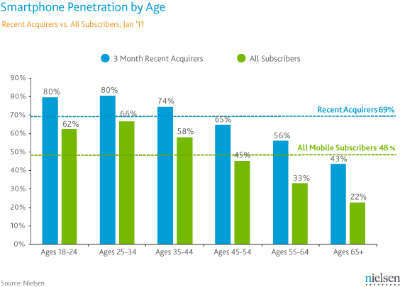 If your customers are under the age of 45, then a large part of them are using smartphones. If your customers are largely wealthy–at least 50 thousand a year–then you’ve got a good chance of reaching them via their smartphones. Looking at the charts Nielsen put out gives you a pretty good idea of where your other best bets are in terms of using smartphones to reach your client base. It will also give you a good idea of who you’ll not want to try reaching by smartphones; if your business caters primarily to older customers with lower incomes, then you know not to try advertising via mobile devices. Either way, in this case, knowing your customers is going to be key toward deciding on an entire possible marketing strategy, and that’s no small thing. This has the potential to save you a lot of money and time that you might otherwise have wasted on an advertising strategy that was less effective than other alternatives may have been in its place. Of course, no matter what kind of marketing you’re using to promote your small business, you’ll need some good quality backup to ensure that contact can be made after the fact. And having some cloud-based telephony features like find-me, follow-me systems and call hold and transfer systems help keep your contacts well in order. But making the contacts is every bit as important as keeping them, so using the right kind of marketing is the first step to getting them in place for you to properly take care of at all.